Early detection of resistance means management will be easier, and it increases the potential to avoid the spread of the resistant biotype. Unfortunately, because resistant plants and susceptible plants look alike, resistance often is not detected until the resistant biotype has spread to 30% or more of the field and perhaps to surrounding fields. Therefore, a proactive approach using diverse weed control tactics is the most effective way to manage herbicide resistance. managing fields, farms, or sites wisely. Doing what it takes to proactively manage herbicide resistance is a good alternative to paying the price for overcoming resistance once it occurs. Rotate herbicides with different mechanisms of action, not just different label names. Avoid consecutive applications of the same herbicide unless it is used in a tank-mix or pre-pack containing an herbicide with a different mechanism of action or used with other weed management options such as cultivation and cultural methods. The herbicides and/or alternative methods used must be active against the target weed. Use herbicides with different mechanisms of action in the same spray tank, in a given crop year or between years. This can be accomplished most efficiently with tank-mixes and pre-packs. Tank-mixes and pre-packs are combinations of two or more herbicides applied as a single mixture. 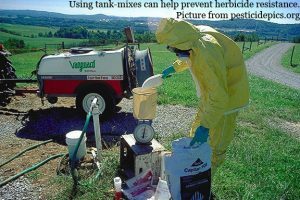 Tank-mixing allows for adjusting of the ratio of herbicides to fit local weed and soil conditions, while premixes are formulated by the manufacturer. The combinations are designed to broaden the spectrum of weeds controlled by an individual herbicide and, if the combination is composed of herbicides with different mechanisms of action active against the same weeds, will contribute to resistance management. The different herbicides in the mixture must be active against the target weeds so that weed biotypes resistant to one mechanism of action are controlled by the herbicide partner with a different mode of action. Theoretically, repeated use of any tank-mix or pre-pack combination may give rise to herbicide resistance, if resistance mechanisms to each herbicide in the mix arise together but the probability is very low. Minimize the use of long-residual herbicides. Susceptible plants emerging later in the season following use of a long-residual herbicide (or multiple applications of a non-residual herbicide) are still exposed to the herbicide, thereby increasing selection pressure. Apply herbicides evenly and accurately (see calibration), and use labeled application rates. Lower than label rates have been shown to increase the likelihood of metabolic resistance. Using higher than labeled rates is illegal and can also enhance selection pressure for resistance. Some weed populations are more prone to resistance in which there is a high frequency of the resistance trait. If the initial frequency is 1 resistant plant in a population of 100,000, as compared with 1 in 10 million, resistance will develop much more rapidly. A high initial frequency of resistant biotypes in many weed families is one reason resistance to ALS inhibitors develops rapidly. 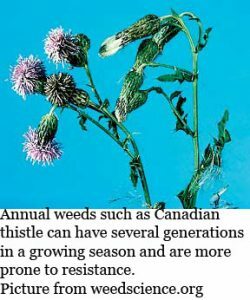 Annual weeds can have several reproductive generations per growing season, and those that cross pollinate tend to be more prone to develop resistance. Species that have adaptations for seed dispersal over greater distances also tend to be more prone to develop resistance, or the resistant biotype spreads more rapidly. Where a strong resistance trait is present, failure will be more apparent in weed species that are initially highly susceptible to the herbicide. If a species is highly susceptible, fewer susceptible plants escape treatment and reproduce. Only resistant biotypes survive and reproduce. Capitalize on cultural practices to reduce reliance on herbicides. When fewer non-chemical control methods (such as cultivation) are used, resistance is more likely to develop, or will develop more rapidly. 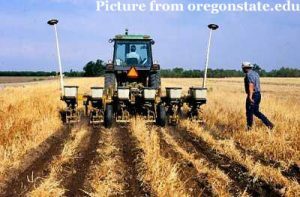 Use correct row spacing, proper fertility, optimum planting dates, and management of other pests to maximize the crop’s ability to compete with weeds. Where erosion and/or limited soil moisture are not a concern supplement chemicals with timely cultivation. For annual cropping systems, start with a clean field and control weeds early by using a burn down treatment or tillage in combination with a pre-emergence residual herbicide, as appropriate. Do not let weeds to go to seed. Rotate crops to allow greater flexibility in choosing different tillage practices and/or the use of herbicides with different mechanisms of action. Changing tillage practices and herbicides makes it more likely that you avoid consistently favoring the same weed species. NOTE: It is possible to rotate crops and, yet, still be using the same herbicide MOA to control the same weed. To illustrate, there are several ALS-inhibiting herbicides (from the sulfonylurea and imidazolinone families) for peanuts and cotton that can be applied either pre-emergence or post-emergence. In this case, you should be aware that it is possible to apply the same type of herbicide for pigweed control every year, even though cotton and peanuts are grown in rotation. See Spraying by the Numbers. Scout fields regularly and keep good records of herbicide use to aid in planning for future years. Note the weed species that have been present in a given field, which herbicides were applied and where, and what level of control (%) was achieved. 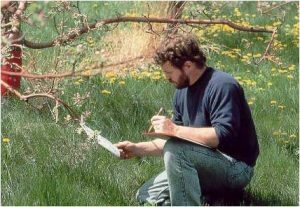 Be aware that resistant weeds can spread from highways, railroads, utility rights-of-way and other areas near your farm or treated site.